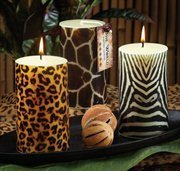 Embolden your inner wild child with these animal inspired patterned candles. Leopard, Giraffe and Zebra. Green Aquatics of Bamboo & Hyacinth. The heart is balanced with Rubrum Lily, Blue Lotus, Rose, White Gardenia, Green Leaves and a touch of Spice.